I found some problem(?) 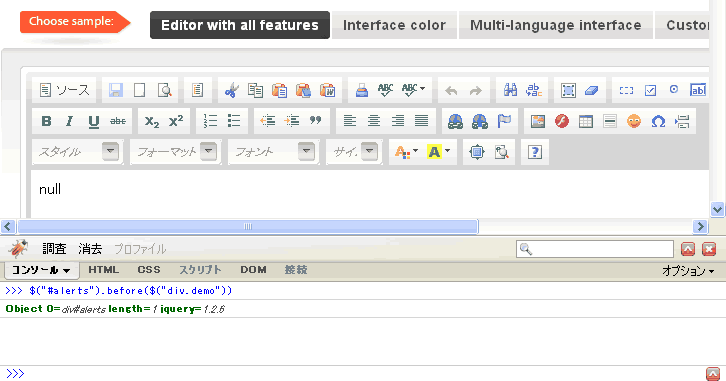 CKEditor with "jQuery before"
2.CKEditor lost input data ,and "null" appear in editor. I can also see this problem in CKEditor demo site. 3.CKEditor lost input data ,and "null" appear in editor. I can't find Why this problem occured. It seems that CKEditor have problems after detaching from the DOM. Possible and quite stable workaround would be getting data from editor and pushing it to new instance, if you want to have it in other place. I've opened a ticket #4398 for this issue. Please add your email in CC field to be notified on any updates. Possible and quite stable workaround would be getting data from editor and pushing it to new instance, if you want to have it in other place. I can escape from "null" !